No more undrinkable, salty water for Budumba Village, thanks to hard work, trust and the sacrifice of a Muslim family. Budumba celebrated the opening of their new well on Monday, July 9 with food, dancing, music and their first sips of clean, fresh water. Before the opening of this new well, Budumba's primary water source was a well that pumped salty water. Though the community could use the salty water for some things, they could not drink it. To get clean, fresh water, the community members had to walk 1.5 miles each way to the borehole in a neighboring village. Because of the far distance and long lines at the borehole, some people used the nearby swamp for drinking water instead. Kibo committed to helping Budumba gain access to clean, fresh water. The Community-Led Total Sanitation (CLTS) staff helped the community attain high hygiene standards by teaching them how to build their own pit latrines, dishwashing racks, hand-washing stations and showers. The community then elected 10 members of the village to a water-user committee, which oversaw the collection of funds for the borehole's construction. Kibo staff member Alex Walyomu encouraged everyone in the community to make a financial contribution to the construction of the new well. Budumba's well compound is a model for how every well should look. The fencing is wide to prevent animals from approaching the well, and there is plenty of room to retrieve water. After 11 months of hard work attaining high hygiene and sanitation standards, everyone in the community is also responsible for maintaining the cleanliness of the well and the area around it. The people of Budumba have benefitted so much from their sanitation and hygiene education that they are now teaching people in neighboring villages about the importance of sanitation facilities and showing them how to build pit latrines, dishwashing racks, hand-washing stations and showers. Many communities in the Busoga region have been robbed by con-artists and impostor NGOs. However, the Budumba community trusted Kibo because of the 11 months the staff spent on building relationships and teaching about sanitation and hygiene. The people of Budumba also entrusted money to their fellow community members — six women and four men from the village — who were elected to the water-user committee. The community assigned the committee to manage the funds for the well. It was an act of trust in Kibo and in each other that the community members contributed the money necessary for the construction of the borehole. Because of this, the whole community has a sense of ownership over the well, and the people in the village trust each other more. The well is open from 6 a.m. – 7 p.m. daily. No one is allowed to bring animals to drink from the well. Everyone is responsible for maintaining the fence around the well and the cleanliness of the compound. Anyone that violates any bylaw will be fined. Every water user is required to pay 4,000 shillings ($1) per year towards repair and maintenance of the well. The new well in the part-Christian, part-Muslim village of Budumba would not have been possible without the personal sacrifice of a Muslim family. The surveyor who found the best place to dig for fresh water in Budumba decided on a section of land that belonged to a Muslim father and son, Mr. Sadala and Muzamiru. The family rejoiced that God placed fresh water on their land of all the land in the large village of Budumba. They joyfully donated the 30x40 ft. plot of land to their village so that the borehole could be drilled on a neutral space that belongs to everyone. Mr. Sadala, Muzamiru and the water-user committee signed the land agreement promptly so that everyone in the village could be equally responsible for the well as soon as the borehole was drilled. As a faith-inspired nonprofit, Kibo firmly believes that religious diversity can be grounds for unity and peace, rather than division and discord. 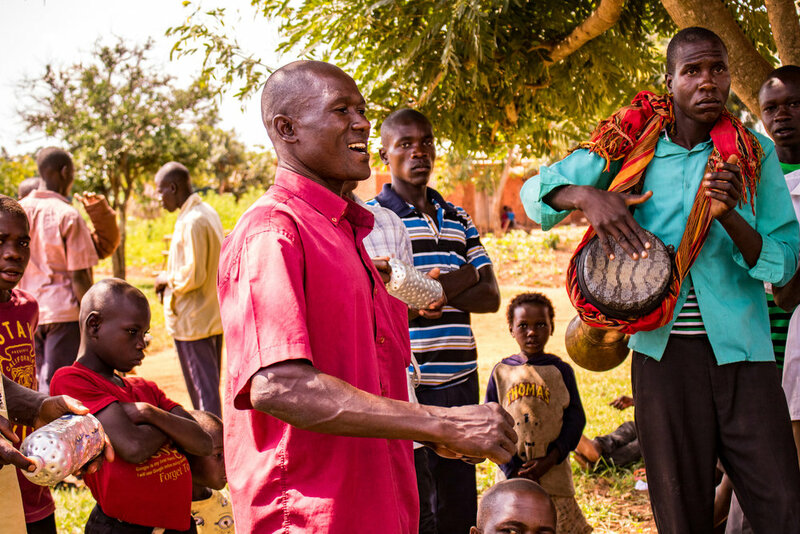 Budumba's new well not only provides clean, fresh water to an entire village, but it also serves as a reminder of the trust, respect and love that a community made possible when it worked together.